What is the purpose of the Fire Resistant Security Cupboard? The Fire Resistant Security Cupboard is simply a great way to keep large amounts of valuable documents and supplies safe and secure. Theft is not the only problem that faces personal papers and other valuable items, but protecting these sensitive things from fire and other elements is just as important. These cupboards are built to do just that. This will fit easily in any filing room, business or home office, and even a garage. It would also work well in classrooms and laboratories that require the safe storage of a variety of sensitive documents and supplies. Law offices, as well, specifically handle the very confidential information of their clients and the Fire Resistant Security Cupboard would suit their need beautifully. From office managers to paralegals to teachers and administrators, these cabinets offer a level of security and comfort that is vital for these professions and the clients/employees they serve. The information that passes through these businesses is highly confidential and keeping them safe from prying eyes is imperative to maintain that level of trust afforded them. First of all, these cupboards are built to hold large amounts of papers and documents for safekeeping. It comes in two sizes and is fire-resistant. It has 4 adjustable shelves with an 8 lever VdS certified high security lock to deter any unauthorised access. The Fire Resistant Security Cupboard comes with a standard 1-year parts and labour warranty and will be delivered to your doorstep within 3-5 working days without additional charge. We guarantee to match any price you may find elsewhere that beats our own. 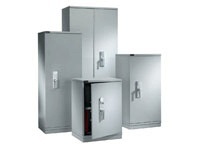 The type of storage that the Fire Resistant Security Cupboard provides is a must should you have large quantities of documents that need to be confidentially stored and maintained.